Abdullah M. I. Syed was born in Karachi, Pakistan. He is presently working and living in both Karachi and Sydney, where he is completing his PhD in Fine Arts practice at the College of Fine Arts (COFA), University of New South Wales. Syed holds a BA degree in Design (1999) and MEd (2001) from the University of Central Oklahoma (UCO), USA. He also holds an MFA (2009) from COFA. Syed is multi-talented as an artist, freelance designer, and curator. He has coordinated the Design Department at the University of Karachi, Pakistan and has also lectured at UCO, USA. His artwork has been featured in exhibitions in Bangladesh, Sharjah, USA, Australia, Hong Kong, India, UK and Pakistan. 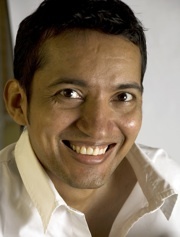 Syed attended the Britto Artists’ workshop (2005) and has been an artist in residence at Cicada Press, Sydney (2009). His co-curating credits include Michael Esson’s: A Survey of Drawing, Michael Kempson’s: A Survey of Prints, Aboriginal Dreams, Let’s Draw the Line, and 6/6: the Labyrinth in Karachi. Syed has acquired a number of awards including the Individual Artist of Oklahoma Award for Installation (2003), the COFA Senior Artist from Asia Scholarship (2006), the UNSW’s Postgraduate Research Scholarship (2009), and Blacktown Art Prize (2010), Sydney. Asian Visualities and Contemporary Narratives. This paper is presented as part of a panel discussion. For more details click here. On the streets of Karachi and Lahore are arrays of popular posters that identify diverse representations of Pakistani masculinity. These posters, printed on recycled advertising and packaging papers, are sold through street vendors, their eye-catching graphics and colours being prominent in the visual urban landscape. The uses of these posters vary, oscillating between personal and community expression. This paper identifies the subcultures of masculine representations in Pakistan by examining popular poster art. The three identified central themes of popular masculine representations are the religious, the secular (local and imported imagery), and electronic collage and appropriated imagery. The posters are visual evidence of a rupture in the portrayal of 'balanced masculinity' (the equal masculine and feminine attributes of the Divine, 'Jalal' and 'Jamal' respectively), an Islamic ideal articulated in the work of Islamic philosopher Seyyed Hossein Nasr and sociologist Durre S. Ahmed. This rupture produces representations of either heightened male effeminacy or a macho hyper-masculinity. These extremes of masculine identity, I argue, result from competing religious fundamentalism and imported ideas of secularism. The tools for making these posters, photographic and digital technology, facilitate this rupture by allowing artificial and extreme representations. The images create a clash of identities, which, if continued, may lead to adverse impacts on the gendered identity of young Pakistani men.